Blog - Page 5 of 15 - Calgary Property Management | Emerald Management & Realty Ltd.Calgary Property Management | Emerald Management & Realty Ltd. When winter rolls in, we can all use a little help conserving energy and avoiding unnecessary insurance claims. Freezing temperatures, icy windshields and treacherous roads —sometimes it feels like it would be best to cozy up inside and binge-watch your favourite Netflix series. To help make your life a little easier and prevent costly winter repairs, the following valuable tips and tricks are provided to avoid an unnecessary “snow day”. 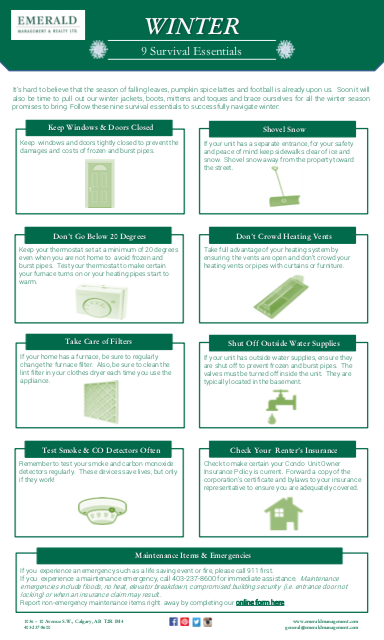 In preparation of winter months, these winter survival essentials have been shared with condominium corporations, condominium owners, and tenants residing in rental properties proudly managed by Emerald Management & Realty Ltd. These tips have been gathered up to make your life a little easier. As we head into the notoriously colder months of the year, taking the time to review these tips could help you pre-empt a disaster when it is freezing outside. If you have any questions, please do not hesitate to contact our office or call 403-237-8600. Should you note a maintenance concern please feel free to use our online maintenance request form. Emerald Management & Realty Ltd. proudly provides property management services in cities and towns located in Alberta, Canada. Before the 2018 year comes to a close, we are proud of the opportunity to recognize all our valued Resident Manager of the Month winners that excelled in their property management duties. Above all, we recognize that our Resident Managers are the face of our team and they work hard each and every day to ensure that the apartments, condominium and rental properties under Emerald Management & Realty Ltd.’s management are clean and tenants are happy. Congratulations to all the winners of 2018! Thank you for your efforts and your contribution to our property management in Calgary & area team! Happy Holidays from everyone at Emerald Management & Realty Ltd. We hope your holidays will be filled with joy and laughter through the New Year. From our family to yours … Merry Christmas! We are pleased to announce that the Emerald Management & Realty Ltd.’s Resident Manager of the Month for November 2018 is Chris V.
Chris has been a resident manager for some time and at multiple locations. One of which, was a rental property being marketed for sale. Throughout the entire listing process that resulted in the successful sale of the apartment building to a private landlord, Chris was professional in when dealing with potential buyers, inspectors and questions from concerned tenants. Chris always maintains the rental apartment building in Calgary, AB with great care and gives special to challenges as they arise. His professionalism and attentiveness creates a great atmosphere that is appreciated by all that interact with him. Chris is a valued member of the team at Emerald Management & Realty Ltd. Chris has recently transferred to a new apartment building and it is with great pleasure that we name him our Resident Manager of the Month for November.